Certified Organic Wheatgrass Kit with Beautiful Wooden Countertop Planter, Wonder Soil, Organic Wheatgrass Seeds, Spray Bottle & Easy to Follow Instructions. 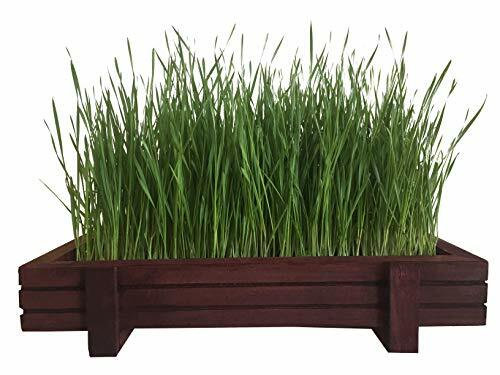 COMPLETE CERTIFIED ORGANIC NON GMO WHEATGRASS KIT CONTAINS EVERYTHING YOU NEED TO SUCCESSFULLY GROW NUTRITIOUS WHEATGRASS IN OUR GORGEOUS WOODEN PLANTER TRAY! > ATTRACTIVE WOODEN PLANTER TRAYS that you can display on your kitchen counters or as table centerpieces to show off your Wheatgrass growing prowess. > EACH PLANTER TRAY MEASURES a convenient 15.75″ x 8″ and is 3.5″ tall with thick 3/4″ sides so that it can even fit on window ledges and smaller spaces. > THIS WHEATGRASS KIT comes complete with the wooden planter tray, an invisible and reusable BPA FREE plastic liner, pre measured Wondersoil, 2.5oz of certified organic wheatgrass seeds, spray bottle and complete easy to follow instructions. You can reuse the wooden planter and liner again and again! > CONVENIENT REFILL KITS. These beautiful trays are a perfect match for our Refill kits that contain the exact right amount of soil and seeds for the wooden tray. Take your pick from Wheatgrass, and the most popular and easy to grow Microgreens, Sunflower, Pea, Radish and Salad Mix. > WHEATGRASS’ NUTRITION CONTENT is very impressive; just 1 ounce of wheatgrass juice may offer the same nutritional value as 2.5 pounds of dark leafy greens. Incorporate it into your daily diet by juicing, adding to smoothies or salads or leaving out a tray for your cat or dog! > MAKES A GREAT GIFT for anyone you would like to encourage to eat more healthily! 100% SATISFACTION GUARANTEED – LOVE IT OR GET YOUR MONEY BACK!